Terminology is important, so that all Hyperledger Fabric users and developers agree on what we mean by each specific term. What is a smart contract for example. The documentation will reference the glossary as needed, but feel free to read the entire thing in one sitting if you like; it’s pretty enlightening! Used by gossip to make sure peers in different organizations know about each other. When a configuration block that contains an update to the anchor peers is committed, peers reach out to the anchor peers and learn from them about all of the peers known to the anchor peer(s). Once at least one peer from each organization has contacted an anchor peer, the anchor peer learns about every peer in the channel. Since gossip communication is constant, and because peers always ask to be told about the existence of any peer they don’t know about, a common view of membership can be established for a channel. 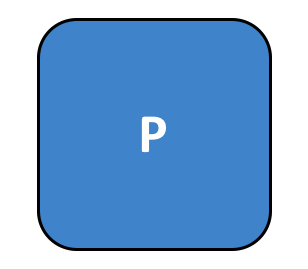 For example, let’s assume we have three organizations — A, B, C — in the channel and a single anchor peer — peer0.orgC — defined for organization C. When peer1.orgA (from organization A) contacts peer0.orgC, it will tell peer0.orgC about peer0.orgA. And when at a later time peer1.orgB contacts peer0.orgC, the latter would tell the former about peer0.orgA. 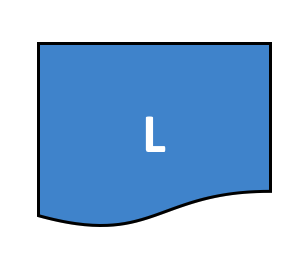 From that point forward, organizations A and B would start exchanging membership information directly without any assistance from peer0.orgC. As communication across organizations depends on gossip in order to work, there must be at least one anchor peer defined in the channel configuration. It is strongly recommended that every organization provides its own set of anchor peers for high availability and redundancy. An ACL, or Access Control List, associates access to specific peer resources (such as system chaincode APIs or event services) to a Policy (which specifies how many and what types of organizations or roles are required). The ACL is part of a channel’s configuration. It is therefore persisted in the channel’s configuration blocks, and can be updated using the standard configuration update mechanism. An ACL is formatted as a list of key-value pairs, where the key identifies the resource whose access we wish to control, and the value identifies the channel policy (group) that is allowed to access it. For example lscc/GetDeploymentSpec: /Channel/Application/Readers defines that the access to the life cycle chaincode GetDeploymentSpec API (the resource) is accessible by identities which satisfy the /Channel/Application/Readers policy. A set of default ACLs is provided in the configtx.yaml file which is used by configtxgen to build channel configurations. The defaults can be set in the top level “Application” section of configtx.yaml or overridden on a per profile basis in the “Profiles” section. Block B1 is linked to block B0. Block B2 is linked to block B1. 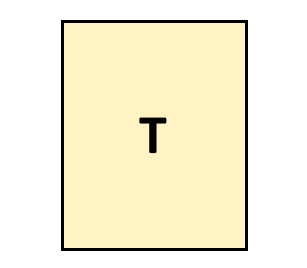 A block contains an ordered set of transactions. It is cryptographically linked to the preceding block, and in turn it is linked to be subsequent blocks. 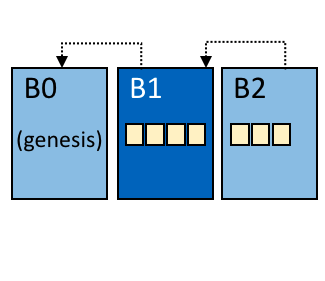 The first block in such a chain of blocks is called the genesis block. Blocks are created by the ordering system, and validated by peers. Blockchain B contains blocks 0, 1, 2. The ledger’s chain is a transaction log structured as hash-linked blocks of transactions. Peers receive blocks of transactions from the ordering service, mark the block’s transactions as valid or invalid based on endorsement policies and concurrency violations, and append the block to the hash chain on the peer’s file system. 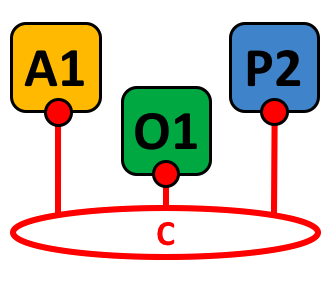 Channel C connects application A1, peer P2 and ordering service O1. A channel is a private blockchain overlay which allows for data isolation and confidentiality. A channel-specific ledger is shared across the peers in the channel, and transacting parties must be properly authenticated to a channel in order to interact with it. 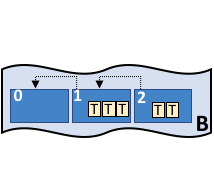 Channels are defined by a Configuration-Block. Each Peer on a channel validates ordered blocks of transactions and then commits (writes/appends) the blocks to its replica of the channel Ledger. Peers also mark each transaction in each block as valid or invalid. Concurrency Control Version Check is a method of keeping state in sync across peers on a channel. Peers execute transactions in parallel, and before commitment to the ledger, peers check that the data read at execution time has not changed. If the data read for the transaction has changed between execution time and commitment time, then a Concurrency Control Version Check violation has occurred, and the transaction is marked as invalid on the ledger and values are not updated in the state database. Contains the configuration data defining members and policies for a system chain (ordering service) or channel. Any configuration modifications to a channel or overall network (e.g. a member leaving or joining) will result in a new configuration block being appended to the appropriate chain. This block will contain the contents of the genesis block, plus the delta. A broader term overarching the entire transactional flow, which serves to generate an agreement on the order and to confirm the correctness of the set of transactions constituting a block. In a Raft ordering service, these are the ordering nodes actively participating in the consensus mechanism on a channel. If other ordering nodes exist on the system channel, but are not a part of a channel, they are not part of that channel’s consenter set. A consortium is a collection of non-orderer organizations on the blockchain network. These are the organizations that form and join channels and that own peers. While a blockchain network can have multiple consortia, most blockchain networks have a single consortium. At channel creation time, all organizations added to the channel must be part of a consortium. However, an organization that is not defined in a consortium may be added to an existing channel. A chaincode definition is used by organizations to agree on the parameters of a chaincode before it can be used on a channel. Each channel member that wants to use the chaincode to endorse transactions or query the ledger needs to approve a chaincode definition for their organization. Once enough channel members have approved a chaincode definition to meet the Lifecycle Endorsement policy (which is set to a majority of organizations in the channel by default), the chaincode definition can be committed to the channel. After the definition is committed, the first invoke of the chaincode (or, if requested, the execution of the Init function) will start the chaincode on the channel. Hyperledger Fabric supports the addition/removal of members, peers, and ordering service nodes, without compromising the operationality of the overall network. Dynamic membership is critical when business relationships adjust and entities need to be added/removed for various reasons. Refers to the process where specific peer nodes execute a chaincode transaction and return a proposal response to the client application. The proposal response includes the chaincode execution response message, results (read set and write set), and events, as well as a signature to serve as proof of the peer’s chaincode execution. Chaincode applications have corresponding endorsement policies, in which the endorsing peers are specified. Defines the peer nodes on a channel that must execute transactions attached to a specific chaincode application, and the required combination of responses (endorsements). A policy could require that a transaction be endorsed by a minimum number of endorsing peers, a minimum percentage of endorsing peers, or by all endorsing peers that are assigned to a specific chaincode application. Policies can be curated based on the application and the desired level of resilience against misbehavior (deliberate or not) by the endorsing peers. A transaction that is submitted must satisfy the endorsement policy before being marked as valid by committing peers. FabToken is an Unspent Transaction Output (UTXO) based token management system that allows users to issue, transfer, and redeem tokens on channels. FabToken uses the membership services of Fabric to authenticate the identity of token owners and manage their public and private keys. In a leader based consensus protocol, such as Raft, these are the nodes which replicate log entries produced by the leader. In Raft, the followers also receive “heartbeat” messages from the leader. In the event that the leader stops sending those message for a configurable amount of time, the followers will initiate a leader election and one of them will be elected leader. The configuration block that initializes the ordering service, or serves as the first block on a chain. The gossip data dissemination protocol performs three functions: 1) manages peer discovery and channel membership; 2) disseminates ledger data across all peers on the channel; 3) syncs ledger state across all peers on the channel. Refer to the Gossip topic for more details. Hyperledger Fabric CA is the default Certificate Authority component, which issues PKI-based certificates to network member organizations and their users. The CA issues one root certificate (rootCert) to each member and one enrollment certificate (ECert) to each authorized user. A method to initialize a chaincode application. All chaincodes need to have an an Init function. By default, this function is never executed. However you can use the chaincode definition to request the execution of the Init function in order to initialize the chaincode. The process of placing a chaincode on a peer’s file system. The process of starting and initializing a chaincode application on a specific channel. After instantiation, peers that have the chaincode installed can accept chaincode invocations. This method was used in the previous version of the chaincode lifecycle. For the current procedure used to start a chaincode on a channel with the new Fabric chaincode lifecycle introduced as part of the Fabric v2.0 Alpha, see Chaincode-definition. Used to call chaincode functions. A client application invokes chaincode by sending a transaction proposal to a peer. The peer will execute the chaincode and return an endorsed proposal response to the client application. The client application will gather enough proposal responses to satisfy an endorsement policy, and will then submit the transaction results for ordering, validation, and commit. The client application may choose not to submit the transaction results. For example if the invoke only queried the ledger, the client application typically would not submit the read-only transaction, unless there is desire to log the read on the ledger for audit purpose. The invoke includes a channel identifier, the chaincode function to invoke, and an array of arguments. In a leader based consensus protocol, like Raft, the leader is responsible for ingesting new log entries, replicating them to follower ordering nodes, and managing when an entry is considered committed. This is not a special type of orderer. It is only a role that an orderer may have at certain times, and then not others, as circumstances determine. Each Organization can own multiple peers on each channel that they subscribe to. One or more of these peers should serve as the leading peer for the channel, in order to communicate with the network ordering service on behalf of the organization. The ordering service delivers blocks to the leading peer(s) on a channel, who then distribute them to other peers within the same organization. A ledger consists of two distinct, though related, parts – a “blockchain” and the “state database”, also known as “world state”. Unlike other ledgers, blockchains are immutable – that is, once a block has been added to the chain, it cannot be changed. In contrast, the “world state” is a database containing the current value of the set of key-value pairs that have been added, modified or deleted by the set of validated and committed transactions in the blockchain. It’s helpful to think of there being one logical ledger for each channel in the network. In reality, each peer in a channel maintains its own copy of the ledger – which is kept consistent with every other peer’s copy through a process called consensus. The term Distributed Ledger Technology (DLT) is often associated with this kind of ledger – one that is logically singular, but has many identical copies distributed across a set of network nodes (peers and the ordering service). The primary unit of work in a Raft ordering service, log entries are distributed from the leader orderer to the followers. The full sequence of such entries known as the “log”. The log is considered to be consistent if all members agree on the entries and their order. The Membership Service Provider (MSP) refers to an abstract component of the system that provides credentials to clients, and peers for them to participate in a Hyperledger Fabric network. Clients use these credentials to authenticate their transactions, and peers use these credentials to authenticate transaction processing results (endorsements). While strongly connected to the transaction processing components of the systems, this interface aims to have membership services components defined, in such a way that alternate implementations of this can be smoothly plugged in without modifying the core of transaction processing components of the system. Membership Services authenticates, authorizes, and manages identities on a permissioned blockchain network. The membership services code that runs in peers and orderers both authenticates and authorizes blockchain operations. It is a PKI-based implementation of the Membership Services Provider (MSP) abstraction. A defined collective of nodes that orders transactions into a block. The ordering service exists independent of the peer processes and orders transactions on a first-come-first-serve basis for all channel’s on the network. The ordering service is designed to support pluggable implementations beyond the out-of-the-box SOLO and Kafka varieties. The ordering service is a common binding for the overall network; it contains the cryptographic identity material tied to each Member. Also known as “members”, organizations are invited to join the blockchain network by a blockchain service provider. An organization is joined to a network by adding its Membership Service Provider (MSP) to the network. The MSP defines how other members of the network may verify that signatures (such as those over transactions) were generated by a valid identity, issued by that organization. The particular access rights of identities within an MSP are governed by policies which are also agreed upon when the organization is joined to the network. 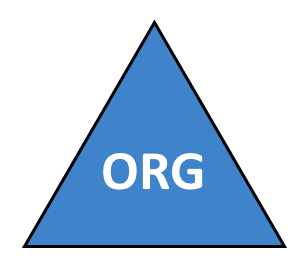 An organization can be as large as a multi-national corporation or as small as an individual. The transaction endpoint of an organization is a Peer. A collection of organizations form a Consortium. While all of the organizations on a network are members, not every organization will be part of a consortium. A network entity that maintains a ledger and runs chaincode containers in order to perform read/write operations to the ledger. Peers are owned and maintained by members. Policies are expressions composed of properties of digital identities, for example: Org1.Peer OR Org2.Peer. They are used to restrict access to resources on a blockchain network. For instance, they dictate who can read from or write to a channel, or who can use a specific chaincode API via an ACL. Policies may be defined in configtx.yaml prior to bootstrapping an ordering service or creating a channel, or they can be specified when instantiating chaincode on a channel. A default set of policies ship in the sample configtx.yaml which will be appropriate for most networks. Confidential data that is stored in a private database on each authorized peer, logically separate from the channel ledger data. Access to this data is restricted to one or more organizations on a channel via a private data collection definition. Unauthorized organizations will have a hash of the private data on the channel ledger as evidence of the transaction data. Also, for further privacy, hashes of the private data go through the Ordering-Service, not the private data itself, so this keeps private data confidential from Orderer. Used to manage confidential data that two or more organizations on a channel want to keep private from other organizations on that channel. The collection definition describes a subset of organizations on a channel entitled to store a set of private data, which by extension implies that only these organizations can transact with the private data. A request for endorsement that is aimed at specific peers on a channel. Each proposal is either an Init or an invoke (read/write) request. A trusted peer used by the FabToken client to assemble a token transaction and list the unspent tokens owned by a given authorized party. A trusted peer used by the FabToken client to assemble a token transaction. A query is a chaincode invocation which reads the ledger current state but does not write to the ledger. The chaincode function may query certain keys on the ledger, or may query for a set of keys on the ledger. Since queries do not change ledger state, the client application will typically not submit these read-only transactions for ordering, validation, and commit. Although not typical, the client application can choose to submit the read-only transaction for ordering, validation, and commit, for example if the client wants auditable proof on the ledger chain that it had knowledge of specific ledger state at a certain point in time. This describes the minimum number of members of the cluster that need to affirm a proposal so that transactions can be ordered. For every consenter set, this is a majority of nodes. In a cluster with five nodes, three must be available for there to be a quorum. If a quorum of nodes is unavailable for any reason, the cluster becomes unavailable for both read and write operations and no new logs can be committed. New for v1.4.1, Raft is a crash fault tolerant (CFT) ordering service implementation based on the etcd library of the Raft protocol <https://raft.github.io/raft.pdf>`_. Raft follows a “leader and follower” model, where a leader node is elected (per channel) and its decisions are replicated by the followers. Raft ordering services should be easier to set up and manage than Kafka-based ordering services, and their design allows organizations to contribute nodes to a distributed ordering service. The Hyperledger Fabric client SDK provides a structured environment of libraries for developers to write and test chaincode applications. The SDK is fully configurable and extensible through a standard interface. Components, including cryptographic algorithms for signatures, logging frameworks and state stores, are easily swapped in and out of the SDK. The SDK provides APIs for transaction processing, membership services, node traversal and event handling. Currently, the two officially supported SDKs are for Node.js and Java, while three more – Python, Go and REST – are not yet official but can still be downloaded and tested. A smart contract is code – invoked by a client application external to the blockchain network – that manages access and modifications to a set of key-value pairs in the World State. In Hyperledger Fabric, smart contracts are referred to as chaincode. Smart contract chaincode is installed onto peer nodes and then defined and used on one or more channels. Current state data is stored in a state database for efficient reads and queries from chaincode. 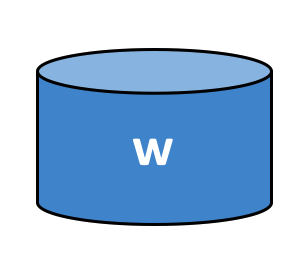 Supported databases include levelDB and couchDB. Contains a configuration block defining the network at a system level. The system chain lives within the ordering service, and similar to a channel, has an initial configuration containing information such as: MSP information, policies, and configuration details. Any change to the overall network (e.g. a new org joining or a new ordering node being added) will result in a new configuration block being added to the system chain. The system chain can be thought of as the common binding for a channel or group of channels. For instance, a collection of financial institutions may form a consortium (represented through the system chain), and then proceed to create channels relative to their aligned and varying business agendas. Transactions are created when a chaincode or FabToken client is used to read or write to data from the ledger. If you are invoking a chaincode, application clients gather the responses from endorsing peers and then package the results and endorsements into a transaction that is submitted for ordering, validation, and commit. If using FabToken to create a token transaction, the FabToken client uses a prover peer to create a transaction that is submitted to the ordering service and then validated by committing peers. Also known as the “current state”, the world state is a component of the HyperLedger Fabric Ledger. The world state represents the latest values for all keys included in the chain transaction log. Chaincode executes transaction proposals against world state data because the world state provides direct access to the latest value of these keys rather than having to calculate them by traversing the entire transaction log. The world state will change every time the value of a key changes (for example, when the ownership of a car – the “key” – is transferred from one owner to another – the “value”) or when a new key is added (a car is created). As a result, the world state is critical to a transaction flow, since the current state of a key-value pair must be known before it can be changed. Peers commit the latest values to the ledger world state for each valid transaction included in a processed block.